We all know that when it comes to fall decorating, pumpkins are our go-to project idea for bringing that autumn feel to any room, porch or garden. But it doesn’t have to be that same old jack o’lantern, and it doesn’t have to be just about Halloween. Pumpkins are a part of the harvest, and should be celebrated as part of the fall bounty in our homes. 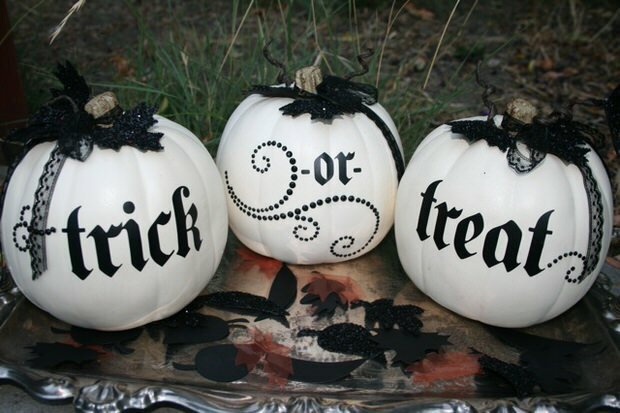 With that in mind, we searched the blogosphere for some pretty pumpkin decorating ideas! Whether these ideas and tutorials use natural pumpkins, or those great carve-able craft pumpkins that allow you to reuse them from year to year, we know you will think these pumpkins are pretty enough for the whole season, right through Thanksgiving! Update – yes there are more than 11 ideas below. We keep finding more and can’t resist adding them to the post! We love this first project from ‘the Merry Thought‘. 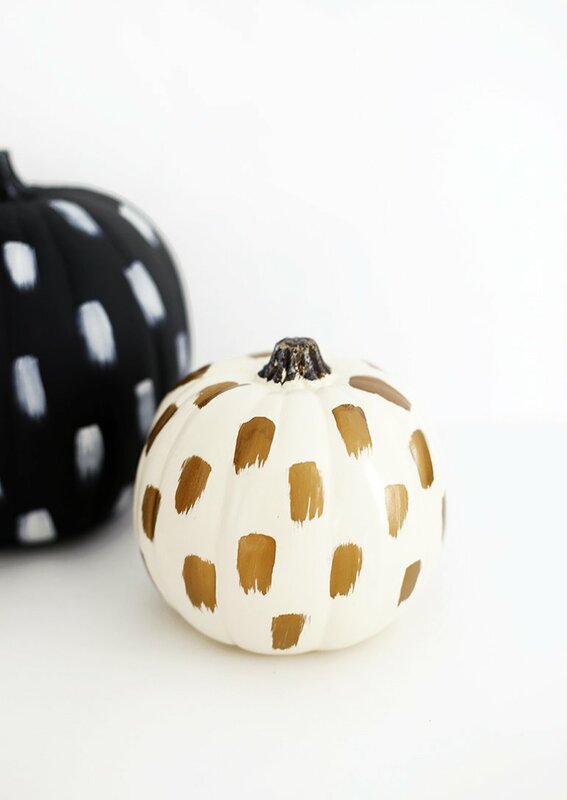 These DIY brushstroke pumpkins are simple and easy and they look fabulous! 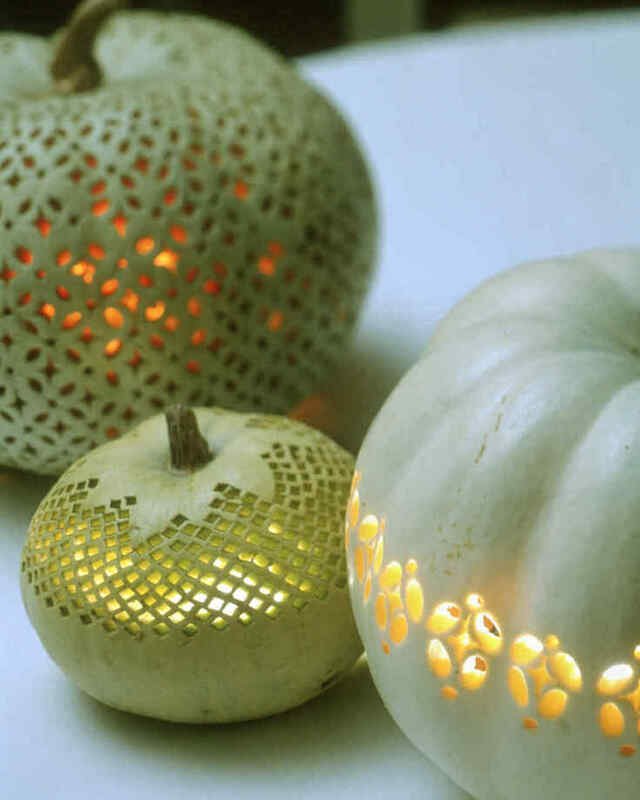 These lace patterned pumpkins from ‘Martha‘ are a little time consuming, but have you ever seen anything so amazingly charming? What a perfect centerpiece for a party! 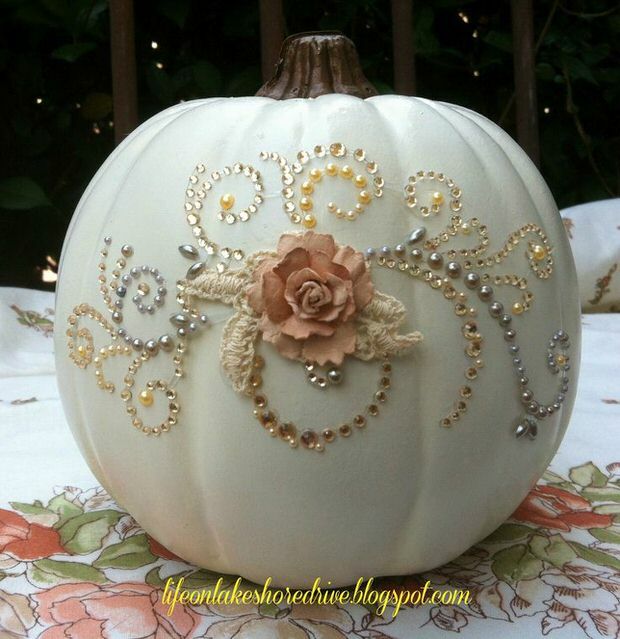 LOVE this tinker bell pumpkin carving idea, complete with pixie dust! Full instructions on ‘Instructables‘! 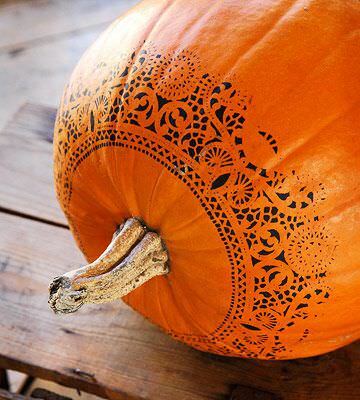 Here is one of the newest pumpkin decorating ideas that we’ve seen. From ‘A Kailo Chic Life‘, gold splatter painted pumpkins. Love these! 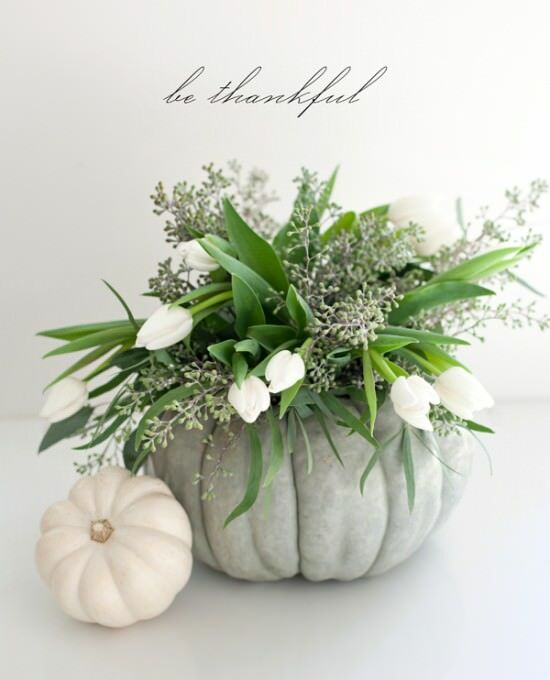 This DIY pumpkin centerpiece by ‘One Charming Party‘ has quick and easy instructions. She used a real pumpkin, which I love because it’s just so organic and, well, fall like… but I don’t see any reason you couldn’t use a craft pumpkin. 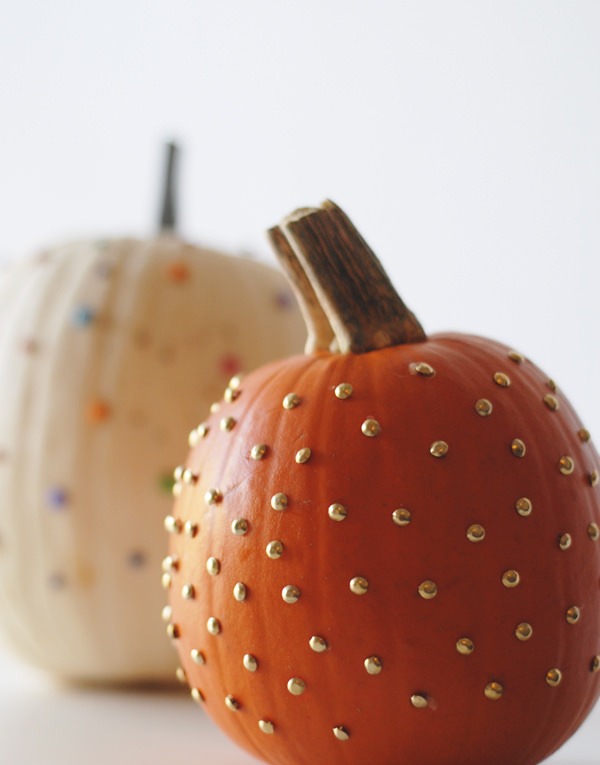 We love these blinged out pumpkin decorating ideas from ‘Chaos Served Daily‘, mostly because they take 5 minutes, but also ’cause they’re so pretty! Find out how to paint pumpkins pretty from ‘Perfectly Imperfect‘. Complete step by step, including what products they used to get these wonderful finishes. Also done on foam pumpkins, so they can be brought out every year. 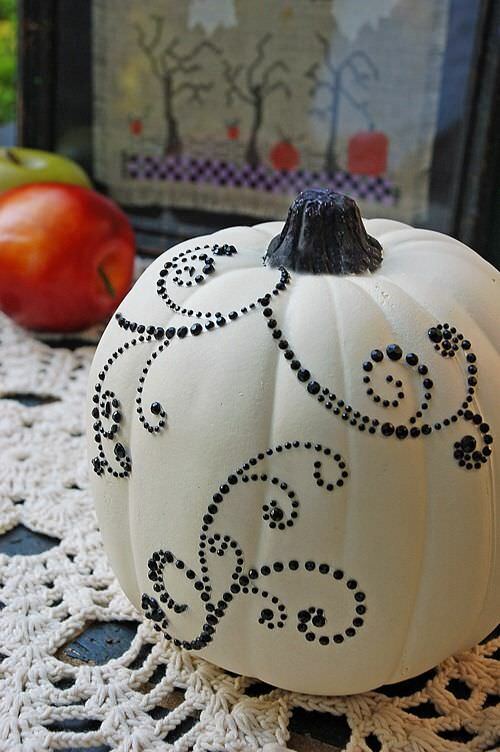 Make a stenciled pumpkin, from ‘BHG‘… quick and easy pumpkin painting idea! More pumpkin decorating ideas with glitz from ‘Life on Lakeshore Drive‘. This is perfect for a glam look! I had to throw in these last couple just for inspiration…. From ‘Seeing Ink Spots‘, these trick or treat pumpkins remind us that we can have some fun too! 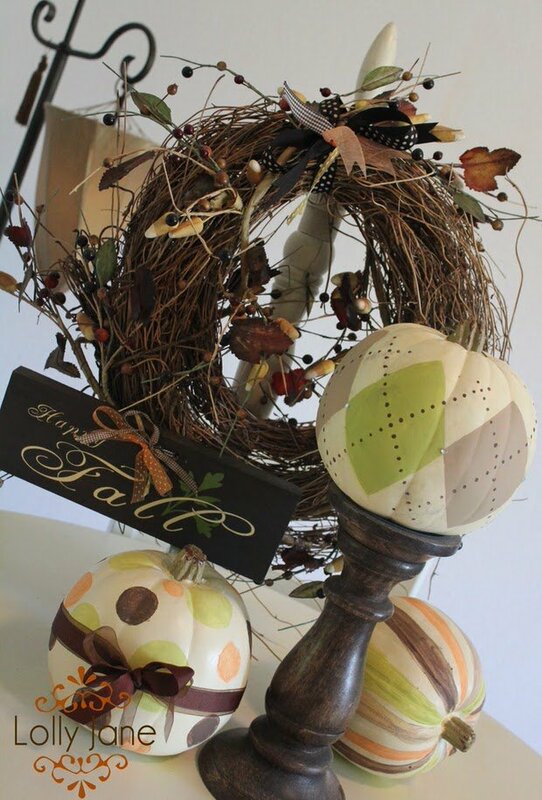 Finally, from ‘Lolly Jane‘, these DIY patterned pumpkins are really fall decor to go right through the season. She used acrylic paints, but I was wondering… with all the colored and metallic Sharpies available now, could you use them? 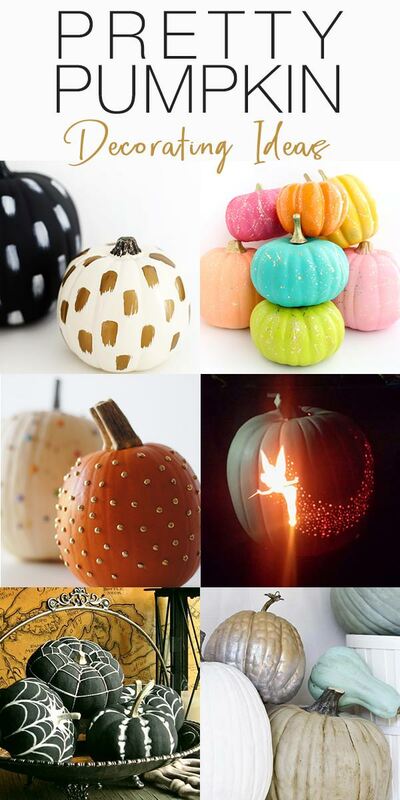 Make some pretty pumpkins, and share your ideas in comments! 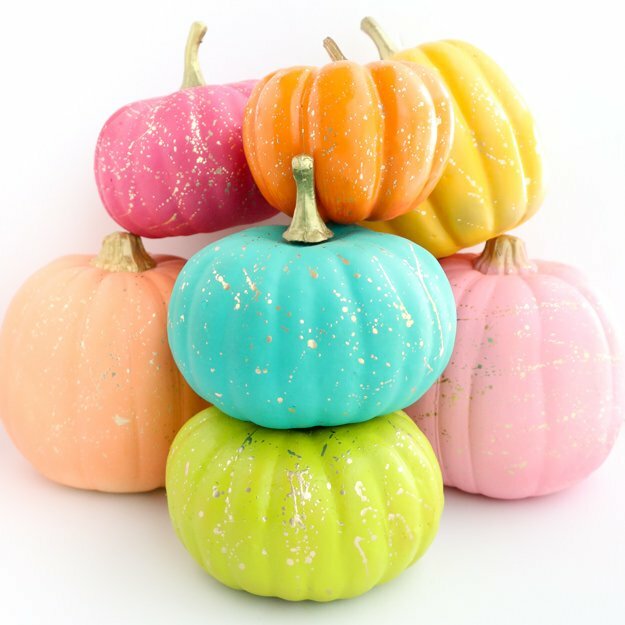 From ‘A Subtle Revelry‘, these pushpin pumkins are really cool & different! 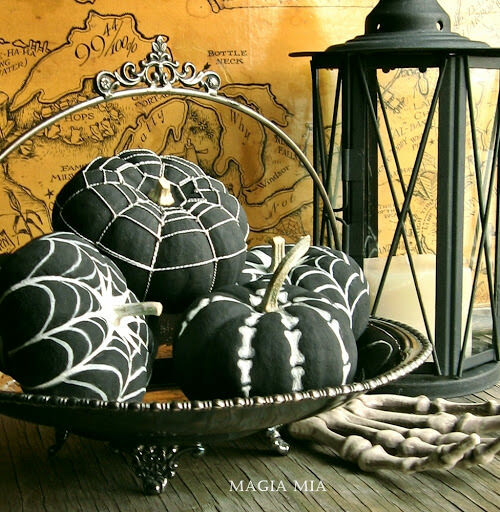 Over at ‘Magia Mia‘, they created these wonderful black painted pumkins! They even used glow in the dark paint to paint the webs and skeletons! 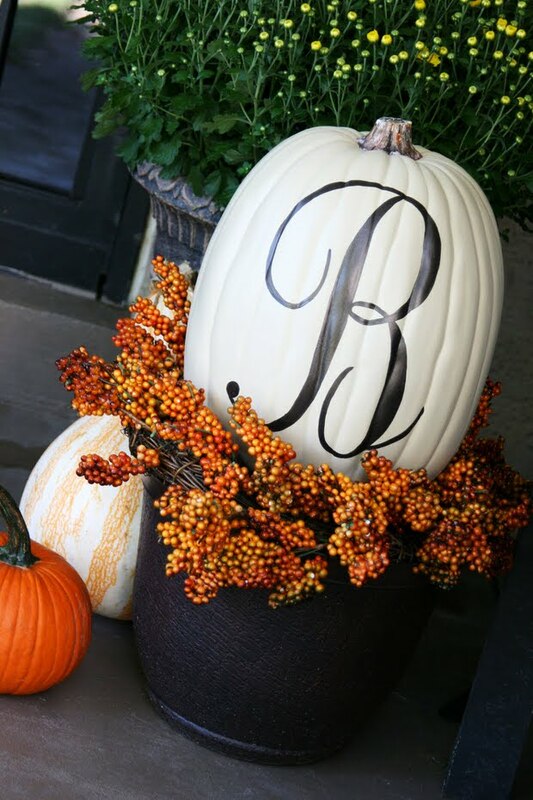 From ‘The Butlers‘, this monogram pumpkin decorating idea can be used with either a real pumpkin or a faux one. Easy tutorial, classy project! O.k., now that’s all the pumpkin decorating ideas. For now anyway! We think you will also love our posts on No Carve Pumpkin Decorating and 18 Classy Fall Decorating Ideas! Don’t forget to pin your favorites for later! Previous Post Starry Starry String Lights : Decor Ideas for Year Round!